The first projections did not leave any room for doubts. A France in state of emergence, in a day marked by feminist protests and a press boycott directed towards National Front’s candidate Marine Le Pen, in addition to the highest abstention rate in the past fifty years, chose Emmanuel Macron as its next President. In spite of obtaining approximately two thirds of the popular vote, the centrist independent was unable to prevent his opponent from achieving the highest result in the history of the far-right party. The final results can be followed here. While the continuingly low turnout signaled bad news for Emmanuel Macron, the most likely candidate to be hurt if voters who witnessed the elimination of their first pick in the first round decided to stay home, his emphatic victory did not come as a surprise. As polls predicted, Macron managed to appeal to a broader range of voters, and unlike what happened in the Brexit vote, and the U.S. Presidential elections, the unlikely winner did not manage to beat the odds. However, the number of blank and null votes observed, while expectedly higher in second rounds, reached an all-time high, indicating that 12% of the electorate (adding to the 25% abstention) was not happy with either candidate. 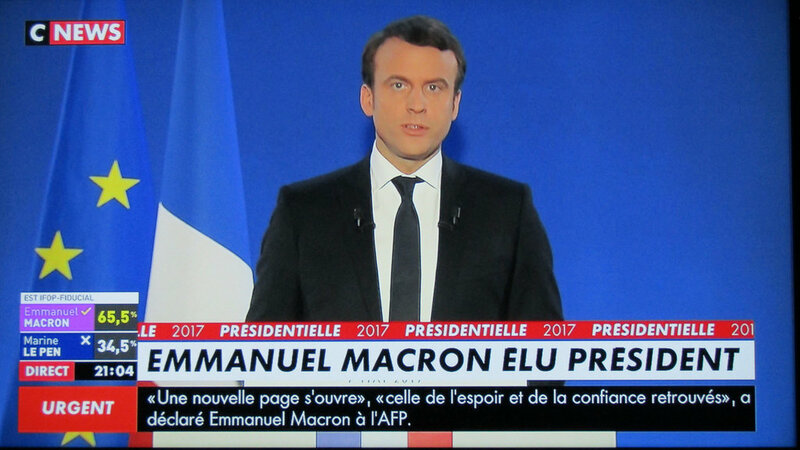 In his victory speech, Emmanuel Macron acknowledged the divisions in his country, and vowed to look after the most fragile segments of the French society, as well as to respond strongly to the threat posed by terrorism, both at the national and international levels. He also emphasized his commitment to the European Union, and to address the challenges created by climate change, and the digital revolution. As he arrived at the Louvre to thank his supporters, the Anthem of Europe was heard, and Macron promised to serve with love, protect democratic values, and urged voters to give him parliamentary majority in June’s legislative elections. Marine Le Pen’s concession speech, on the other hand, denounced France’s vote for continuity, and declared her intentions to challenge the status quo of the country’s politics. She also stated her intent to give a voice to all patriots, and expressed belief in the importance of deeply transforming the party, in an effort to meet the expectations of the French people, and rise to the historic opportunity created by the National Front’s immense result. Numerous political figures were quick to react to the results of the first projections. Jean-Claude Juncker, President of the European Commission, and Donald Tusk, President of the European Parliament, congratulated Macron for his victory, the former emphasizing France’s European path, while Tusk claimed that Liberty, Equality, and Fraternity had triumphed over ‘fake news’. François Holland called his successor, and expressed his hopes of success for their country. Mariano Rajoy, Alexis Tsipras, António Costa, Angela Merkel and Theresa May, (the latter two via spokespeople), were among the European leaders who saluted the new President of France, and extended wishes of a more prosperous EU. Outside of Europe, Donald Trump, Michel Temer, Shinzo Abe, Narendra Modi, Justin Trudeau and Xi Jinping (the latter via spokesperson) underlined their willingness to strengthen bilateral ties, and work closely with Emmanuel Macron. France and the remaining EU Member States can now breathe a sigh of relief. Emmanuel Macron, an unknown figure just three years ago, obtained a resounding win against Le Pen, becoming the youngest President in French History, and holding back the surge of populism created around the Brexit referendum, and Donald Trump’s Presidential election. After a lengthy and turbulent Presidential campaign, the victor now sets his sights on next month’s legislative elections, which by means of being defined by two-run uninominal system, favors the larger parties. At the midnight of May 14, the handover of power will take place in the Elysée, and Macron is expected to announce his Prime-Minister shortly after. However, his choice might be temporary, as a failure to obtain a parliamentary majority might force him to accept a politician from an opposition party as replacement. For now, Macron is expected to rally the center-left and center-right, possibly negotiating a coalition with the Socialist Party. If he thrives in this endeavor, and obtains a visible result in June, Macron will hold all the cards, and will be able to push through the reforms he promised. His success will dictate whether or not, in the next five years, an extreme left or extreme right party could emerge victorious in the next Presidential elections, jeopardizing the turning of tides on populism, and the victory of the European project that was accomplished on May 7. Photo by *SHERWOOD*, CC BY-NC-SA 2.0.